Nicholson is a new luxury wall light for bathrooms, hallways and living rooms. The rich contrasting textures of hand finished patinated brass and natural translucent marble, create a pleasingly organic disruption to the visually cool geometric design of the light. The design explores abstraction and the importance of line in constructed space. The offset brass rectangle is pierced by a single narrow linear element, which extends the design outside the frame. The Nicholson wall light continues our fascination with the Modernist community of artists working in St Ives over the past hundred years. This new light is inspired by the radical abstract paintings of Ben Nicholson, and works as a companion piece to the Frost sconce. The Nicholson and Frost wall lights are contemporary statement lights for bathrooms, entrances and living rooms. Each wall light is handmade in custom metal finishes at our Sussex workshop. 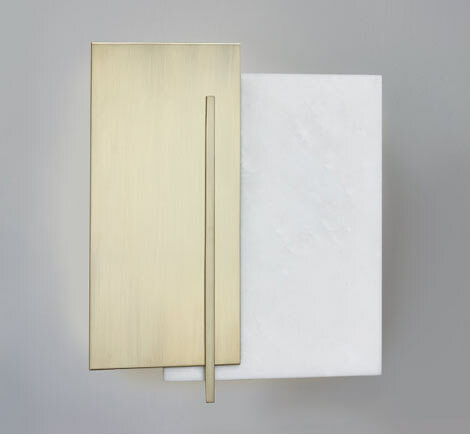 Materials: The Nicholson and the Frost wall light are available in hand finished bronze, nickel or brass, paired with translucent white Italian marble.